As the flat lands gave way to timbered peaks, and the highway began tunneling under the mountains, rather than zipping over the top of them, our anticipation grew. We were nearing our destination. We had come to this place, nestled in a spot where the Smokey and the Blue Ridge stand face-to-face, in search of. . .
. . . rest? peace? a home-away-from-home? Yes, all of these. A home-away-from-home where we could put our responsibilities aside, for a brief time, and rest. Rejuvenate. We didn't find what we were looking for. Instead what we found was a lesson – one we're still learning. I'm going to share more about what we're learning in an upcoming post(s). Sometimes, the very thing you're looking for is where you least expect to find it. I hope you've enjoyed my 'flower art" today. Here's a look at the elements I used. Please click over to the Gallery to see all the beautiful art hanging there this week. These are stunning pieces of art. Wonderful, beautiful colors and textures! Beautifully dreamy, suggestive art... contemplative. So lovely and very intriguing. It's good to know that one can learn and grow even when they don't exactly find what they thought they were looking for. I really enjoy the way different elements draw the eye in each version of the image. The different treatments cause some things to pop and others to subtly blend in the background. Very interesting and enjoyable. what a BEautimous feast for the eyes and soul!! What an inspired creation, June! You pull us in to a gorgeous world of fantasy and beauty. Wonderful and creative colors, great combination, wonderful pictures, I like it! Very artistically and beautiful pictures. So beautiful and 'artsy', June! Very nicely done!! How true about finding something you've been looking for right where you least expected it! 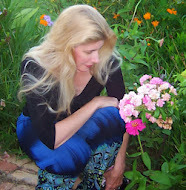 I'm visiting from my WordPress site through Floral Love this week.